2nd Quarter: (A) Justin Cote 2-yard run, Colby Briggs XP good. 3rd Quarter: (NA) Tyler DeMattio 85-yard pass to Ryan Gaumond, T. DeMattio XP good. 4th Quarter: (NA) T. DeMattio 7-yard run, T. DeMattio XP good; T. DeMattio 90-yard run, XP no good. 2nd Quarter: (C) Johnny Hagan 30-yard pass to Kyle Fitzgerald, Owen Lehane XP good; (S) John Burke 1-yard rush, Josh Cocchi XP good. 3rd Quarter: (S) Jeff Grier 66-yard rush, J. Cocchi XP good; (S) J. Grier 18-yard rush, J. Cocchi XP good. 4th Quarter: (S) J. Grier 72-yard rush, J. Cocchi XP good. 2nd Quarter: (KP) Robbie Jarest 1-yard rush, R. Jarest 2pt rush. 3rd Quarter: (F) Nick Gordon 11-yard pass to Ryan Driscoll, XP failed. 4th Quarter: (KP) R. Halliday 14-yard rush, C. Baker XP good; (F) N. Gordon 75-yard pass to Owen Pamieri, P. Chevrant XP good. 1st Quarter: (S) Aaron Strong 3-yard rush, Mitchell Director XP good. 3rd Quarter: (S) A. Strong 5-yard rush, M. Director XP good. 4th Quarter: (OA) Billy Tat 2-yard rush, Cam Perron XP good; (S) A. Strong 1-yard rush, M. Director XP good. 1st Quarter: (T) Noah Leonard 14-yard rush, 2pt rush failed; (T) N. Leonard 17-yard pass to Cory Pintabone, Danny MacDougall 2pt rush. 2nd Quarter: (T) N. Leonard 29-yard pass to Everett Ferreira, Coby Adams XP good. 3rd Quarter: (T) Tryton Zavala 6-yard rush, XP failed; (T) Damien Manning 5-yard rush, Ethan Tavares XP good. #5 Mansfield, 2 vs. #1 Newton South, 3 – Final (2OT) – Click here for a recap and photo gallery from this game. #13 Franklin, 3 vs. #1 Walpole, 4 – Final (OT) – Click here for a Recap and Photo Gallery from this game. 1st Quarter: (N) Natick 24-yard pass, XP good; (F) Nick Gordon 67-yard pass to Ryan Driscoll, Parker Chevrant XP good. 2nd Quarter: (N) Natick 7-yard rush, XP failed; (F) N. Gordon 28-yard pass to Sean Leonard, P. Chevrant XP good. 3rd Quarter: (F) N. Gordon 22-yard pass to R. Driscoll, P. Chevrant XP good; (N) N. Gordon 64-yard pass to R. Driscoll, P. Chevrant XP good; (F) N. Gordon 33-yard pass to S. Leonard, P. Chevrant XP good. 4th Quarter: (N) Natick touchdown rush, XP good; (F) Sean Hofferty 4-yard rush, P. Chevrant XP good; (N) Natick 3-yard rush, XP failed. FRANKLIN, Mass. – Throughout the regular season, the headlines have focused on Franklin’s high-power offense and all of the different skill guys it uses. In the first round of the Division 1 South tournament, the Panthers’ defense took center stage. #4 Franklin’s defense prevented #5 Brockton from getting in the end zone, adjusted to limit the Boxers’ run game, came away with three interceptions and anchored the Panthers to a 26-3 win. After Brockton’s offense combined for 97 yards and three points on its first two drives of the game, the Panthers’ defense limited the Boxers to just 66 yards the rest of the way. Of Brockton’s final seven drives, three ended with interceptions, one with a safety, and two turnover on downs. “Our defense has been pretty good all year in all of our wins,” said Franklin head coach Eian Bain. “It’s been pretty solid all year and in the second half, they won us that game. They put the nail in the coffin and sealed it for us. Brockton’s offense had its lone success of the first two drives of the game. After a good return, the Boxers offense quickly marched 47 yards — all on the ground — into the Franklin red zone on the first drive of the game. But the visitors couldn’t convert as Franklin’s Nolan McLaney and Austin Jordan combined for a tackle for loss on second down, and Brockton fumbled on third, meaning they had to settle for a 27-yard field goal from Carlens Jean. It took Franklin just over two minutes to respond, finding the end zone in just six plays on its first drive of the game. Junior quarterback Nick Gordon (11/16, 178 yards, two touchdowns) converted a third down by finding junior Jake Davis up the seam for a 36-yard gain – the only stopping him from going the distance was his own momentum. After two plays without a gain, Franklin converted another third down, this time Gordon finding a streaking Jack Nally up the middle for a 32-yard touchdown and a 7-3 lead with 2:08 left in the first quarter. The Boxers nearly struck back with an immediate response of their own. Brockton junior running back Ahmik Watterson broke free for a 50-yard scamper to get inside the Franklin 10-yard line. Another run from Watterson put the ball at the 1-yard line. Franklin’s defense came up with a key stop and Brockton was whistled for a dead fall foul, pushing them back to the 15-yard line. Two plays later, Jean’s 25-yard field goal attempt was just wide left and Franklin’s offense took over. The Panthers marched up field, going 74 yards to get into scoring territory at the Brockton 6-yard line. The drive was highlighted by a 27-yard catch from Sean Leonard and a terrific leaping 30-yard catch from Ryan Driscoll on third down. But Brockton’s defense was up to the task, not letting Franklin get any closer. The Panthers settled for a 23-yard field goal from Parker Chevrant and a 10-7 advantage with 6:55 to play in the second quarter. Although Brockton’s defense just had a big stop to get some momentum, Franklin’s defense stole it right back. On the third play of the ensuing drive, Brockton quarterback Michael Norman was intercepted by Driscoll near midfield and he returned it all the way into the red zone at the 18-yard line. Four plays later, on fourth and 2 from the 10-yard line, Bain elected to go for it and Gordon linked up with Leonard, who just got his feet down, in the end zone for a 17-3 advantage with 4:29 left in the first half. Brockton started its drive inside its own 20-yard line and junior linebacker Evan Wertz made a big tackle on third down to force the Boxers to punt. But the snap sailed high on the punter, and by the time he was able to pick it up he stepped out of bounds in the back of the end zone while under pressure from McLaney, resulting in a safety and a 19-3 lead for the Panthers. Franklin had a chance to add onto that lead before half, getting to the Brockton 30-yard line on the ensuing drive but a fumble ended the drive. Brockton moved 30 yards to get into Franklin territory in the final minute of the first half but Owen Palmieri came away with an interception to send the teams into the locker rooms for half. The second half featured a battle of ground games trying to solve two strong defensive fronts. Brockton had 20 plays in the second half with a total of 29 yards. Franklin’s offense didn’t fare much better as it tried to get its ground game going and keep the ball away from the Boxers. The Panthers offense had 30 plays for a total of 57 yards. “We like we had some opportunities to run, that was what they were giving us,” Bain said of keeping the ball on the ground for the majority of plays in the second half. “We didn’t want to give them a short field or anything. They have the athletes to get back in the game in one strike. I don’t want to say we were conservative, we truly believe they were the right play calls but hopefully we can have some more success on the ground next week. The big play of the second half came when Franklin’s defense once again thwarted the Boxers trying to throw the ball. Midway through the fourth quarter, a sack from senior Adam McMorrow forced the Boxers into a 3rd and 15 scenario inside their own 20 yard line. Norman tried to link up with a receiver down field but McLaney stepped in front for the interception. The senior returned it 26 yards to the 1-yard line, setting the Panther offense up. After being stuffed on the first two tries on QB sneaks, Gordon took the next snap in shotgun and pushed his way up the middle for a 26-3 lead with 5:39 to play. Franklin football (6-2) advances to the D1 South Semifinal and will take on top-seeded Xaverian (6-1) on Friday night at 7:00 in Westwood. The Hawks beat BC High 17-0 in the opening round. TAUNTON, Mass. 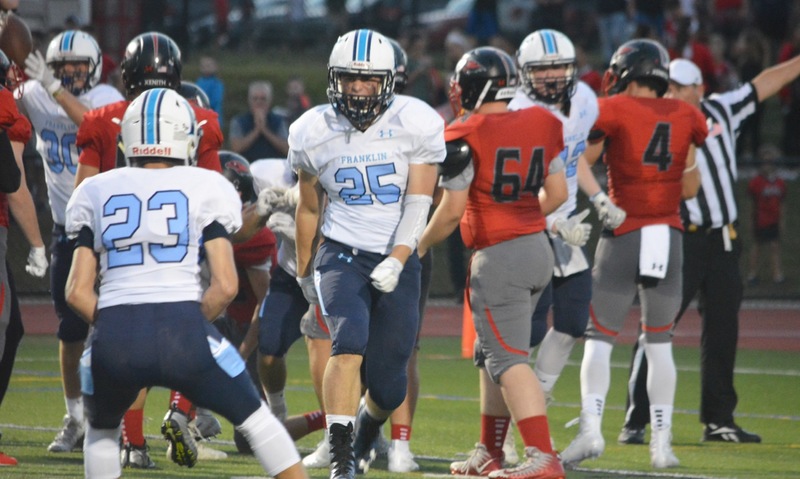 – Heading into Friday night’s contest against Taunton, Franklin head coach Eian Bain wanted to get as many of his skill players involved as possible to keep the Tigers’ defense guessing. Senior quarterback Nick Gordon delivered with a near flawless performance, going 11-for-14 for 243 yards, connecting with six different receivers, and tossing four touchdowns to lead the Panthers to a dominant 42-7 win over Taunton. Franklin was essentially perfect in the first half with Gordon completing all of his passes (7-for-7) and the team recording 254 yards of offense, scoring on all four of its drives for a 28-0 lead at the break. “We got off to a very fast start and I thought we executed the game plan really well,” Bain said. “We try to think about players not plays so we wanted to get certain kids to touch the ball. We had a lot of different kids touch the ball tonight and that wasn’t by accident. It was all Panthers from the get-go. After forcing Taunton to punt on its opening drive, Franklin needed just four plays to find the end zone. Owen Palmieri (10 carries, 50 yards) took the first play for 20 yards and the third for four more, sandwiched around a pass from Gordon to Jack Nally (75 all-purpose yards). On the fourth play, Gordon hit Ryan Driscoll (two catches, 88 yards) on a short bubble screen, and the senior got the block he needed to race for a 32-yard touchdown. Parker Chevrant (6-for-6 extra points) drilled the point after for a 7-0 lead with 6:58 to play in the first quarter. After another defensive stop that resulted in -5 yards for Taunton, Franklin needed just three plays this time around. On a broken play, Gordon scrambled to the left sideline and waited until the last second before linking up with Driscoll. After a nice block, Driscoll was able to cut inside and raced across the field for a 56-yard score and a 14-0 advantage with 2:59 left in the first quarter. “We came out flat, we didn’t answer the bell at all to start the game,” said Taunton head coach Brad Sidwell. “They are a good, athletic team and I know we’d have a tough matchup with them at spots defensively. I thought we might have been able to do a little more offensively but we didn’t. We had one good drive to start the second half running the ball, but we have to do that for all four quarters. Taunton moved the ball some on its next drive but a tackle for loss from junior Austin Jordan put the Tigers in a hole and they were forced to punt. Franklin responded with its most methodical drive of the game, rattling off 10 plays to cover 50 yards. The longest play on the drive was from Gordon to Nally for 16 yards, and Palmieri finished with a 1-yard plunge to make it 21-0 with 5:31 left in the second quarter. Franklin’s defense stuffed Taunton on a 3rd and 1 attempt to force another punt and get the ball back. And the offense wasted little time to move the ball yet again. Nally and Gordon ripped off back-to-back runs that combined for 25 yards and then Gordon found Jake Davis in stride down the right sideline for a 45-yard touchdown and a 28-0 advantage heading into halftime. Taunton looked like a new team coming out in the second half, forcing its first three-and-out of the game to get the ball early in the third quarter. The Tigers offense rewarded the defense with its best drive of the game. With a boost from senior fullback Damian Manning, who had two carries for 16 yards and one catch for five yards — two of those plays resulting in first downs, Taunton got on the board. On the eighth play of the drive, quarterback Noah Leonard used a QB sneak – with a push from Manning – to score from 1-yard out and cap an 80-yard drive to make it 28-7. The momentum carried over to the Taunton defense, which again came up with a stop, including a big pass breakup from Curt Marshall. The Tigers got the ball back with 2:59 left in the third with a chance to make it a two-score game, but Franklin’s defense had other plans. On third and 6, Franklin put pressure on Leonard and forced a quick throw on a screen attempt, and Taunton had to punt. “It could have been closer there, but the defense did a nice job,” Bain said. Franklin’s offense got back into gear, marching 71 yards on six plays, the big play a pass and catch from Gordon to Sean Leonard over the middle for 24 yards. Nally came across in motion and took a simple touch pass forward while on the run and went around the left edge for a 15-yard score and a 35-7 lead with 9:55 to play. It was Gordon’s fourth touchdown pass of the day. Sean Hofferty added a 4-yard rushing touchdown in the final minutes. Franklin football (4-2 overall, 2-2 Hockomock) returns home next Friday to take on Attleboro in what could be a potential playoff preview. Taunton (3-3, 1-3) will try to bounce back when it hits the road to take on King Philip. MANSFIELD, Mass. – Mansfield started Friday night’s league-opener at Alumni Field with back-up quarterback Jack Mousette under center. He lasted two series before an injury, following a 38-yard run, sent him to the sidelines for the rest of the night. With starter Damani Scott unavailable and Mousette on the bench with his arm wrapped in ice, the Hornets turned to senior Aidan Sacco to be the emergency QB. Sacco only threw five times in the game, but he completed three of those passes for 42 yards and the Mansfield defense clamped down, forcing three turnovers in the second half and shutting Franklin out until the final two minutes of a 24-6 victory. Franklin started the season 2-0 for the first time since 2012 and was looking for its first win against Mansfield since its unbeaten 2009 season. The Panthers moved the ball well, but failed to finish drives, twice reaching the red zone but both times coming away with no points. The Panthers drove all the way to the Mansfield 15-yard-line on their opening possession. 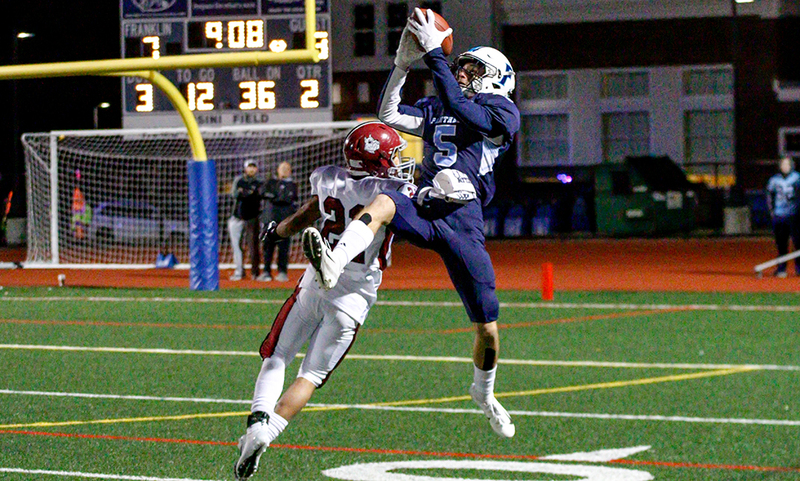 Junior Thomas Gasbarro completed two of his three passes, both to Sean Leonard (six catches, 82 yards), but a draw play at the 19 lost six yards and eventually his keeper on fourth and 15 only gained nine to end the drive. Mansfield made quick work of an 85-yard drive, needing only four plays, to take the lead, but in the process lost its starting quarterback. After Nick Marciano broke free on the right side for a 28-yard gain out to the 43, Mousette raced for 38 yards down to the Franklin 19 but was forced to leave the game with a shoulder injury. Two plays later, Sacco went up the middle for a 14-yard score. 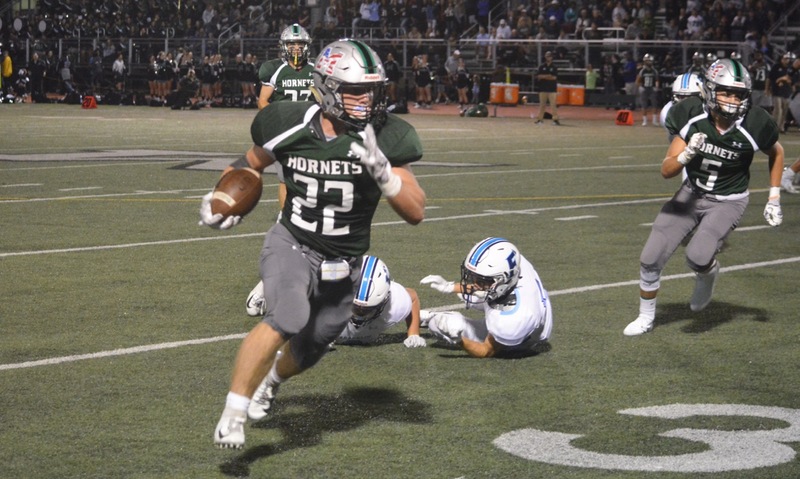 Sacco also fielded punts and his 29-yard return gave the Hornets the ball back at the Franklin 41. Junior Vinnie Holmes (11 carries, 65 yards) gained 27 yards on two carries to get the ball all the way to the Panthers 12, but a fumble on the next hand-off forced Sacco to retreat 18 yards. Two plays later, Michael DeBolt, who was also 3-for-3 on extra points, booted a 35-yard kick for a 10-0 lead. Franklin’s offense went right back to work on its next possession. Senior Nick Gordon (10-23, 174 yards) was the new quarterback and he found Leonard twice in a row for 43 yards down to the Mansfield 17. On third and seven from the 14, Gordon scrambled and his pass to Ryan Driscoll in the back of the end zone was inches over the receiver’s head. The Panthers settled for a field goal attempt but Parker Chevrant’s kick was wide right from 30 yards. Gasbarro intercepted a Sacco pass to end the next Hornets drive, but he slipped on the return and couldn’t gain extra yards after the turnover. Franklin was forced to punt from its own 32, but a high snap rushed the play and it was sliced out of bounds just six yards downfield. Mansfield made the great starting field position count to add a score before the break. After an incomplete pass, Sacco hit Holmes in the flat for a 28-yard gain. Sacco was unable to handle the next shotgun snap but Holmes was able to scoop the loose ball and gain eight yards. On the next play, he bulldozed for two more and a three-score lead. The third quarter was marred by turnovers by both teams. Gordon was intercepted by Cincere Gill and then sacked by Chris Copponi and Daenin Walker to end a possession. Austin Jordan recovered a Mansfield fumble to get it back for the Panthers but only three plays later the Panthers put the ball on the ground and Jack Barry recovered. Late in the fourth quarter, Walker forced another fumble that was recovered by Copponi at midfield. Gill (eight carries, 95 yards) gained four yards on first down and then burst through the right side of the line and raced 46 yards for the touchdown that sealed the win. The Panthers didn’t give up and responded in just four plays. Gordon hit Driscoll on a go route down the near sideline that made sure there wouldn’t be a shutout. The two-point conversion attempt fell incomplete. Mansfield came away with a win, but the Hornets will now head into a showdown with two-time defending league champion King Philip with a third-string quarterback at the helm. According to Redding, the Hornets will be relying even more on their defense to come through. Mansfield (2-1, 1-0) will host King Philip at Alumni Field on Friday night, while Franklin (2-1, 0-1) will try to bounce back right away when Oliver Ames visits Pisini Field. MILFORD, Mass. – On its opening three possessions of the game, Franklin managed about 30 yards of offense and turned the ball over twice. But the Panthers got one more chance to break the scoreless deadlock before halftime and made it count, scoring on the final play of the second quarter. 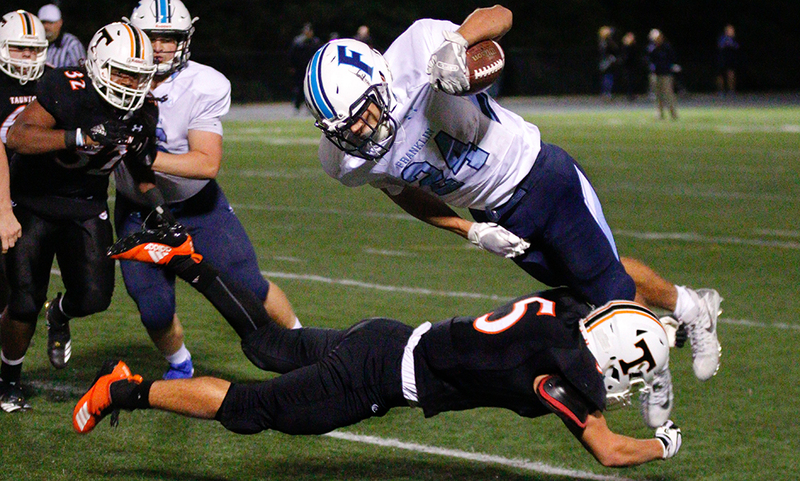 The momentum carried over into the second half, as Franklin would score on both of its possessions in the third quarter to break Friday night’s rivalry game with Milford wide open and pull away for a 21-0 victory that sends the Panthers into league play with a 2-0 record. The game did not get off to a start that either team would have hoped for, with turnovers on the opening two plays. Shapel Feaster fumbled on the first play from scrimmage for the Hawks, but he made up for it on defense by forcing a Jack Nally fumble at the one-yard-line on Franklin’s first play. Both defenses were in control for most of the opening half. A Brendan White sack of Franklin starting quarterback Thomas Gasbarro ended one drive and Ryan Pearl picked off a pass by Nick Gordon, Franklin’s second quarterback, to end another. Milford was trying to mix things up, spreading out the Panthers on one play and bunching up on a power set on another, but the Panthers defense stood tall. With under two minutes remaining in the half, Franklin took possession at its own 42. Gordon (6-11, 147 yards) hit Nally down the sideline for 21 yards and then found Ryan Driscoll (four catches, 115 yards) for nine yards to the Milford 28. After an incomplete pass, Franklin had eight seconds left in the quarter. Gordon dropped back and again looked down the far sideline where Driscoll had gotten open in between two defensive backs for the game’s opening score. The Panthers took control with the opening possession of the second half, marching 75 yards on seven plays to make it a two-score game. Gordon again hit Driscoll on a go-route down the sideline for 38 yards into Milford territory and then found Will Davis for another 11 yards. Three plays, including two Gordon keepers, later, Gordon was able to scramble and keep a play alive before finding a seam for a seven-yard score. The Milford offense had to try and speed up, focusing on the spread formation and the passing game to try and cut into the lead, but that also played right into the strength of the Franklin defense – its secondary. Milford’s junior quarterback Colby Pires completed three of his four passes in the first half, but with the Panthers dropping back into coverage then he was only able to complete two of 14 passes in the second half. Driscoll and Nally both broke up passes in coverage and Nolan McLaney was able to bat a pass down at the line of scrimmage. Franklin’s success defending the pass was largely done without getting much pressure on Pires. Adam McMorrow had the only sack of the game for the Panthers and it came on Milford’s possession. Franklin made it three straight possessions with a touchdown and sealed the win before the end of the third quarter. The Panthers went 57 yards on 11 plays, including a 40-yard pass from Gordon to Driscoll. On third and goal from the six, Gordon took a keeper to the left side and snuck inside the pylon with a leap over the goal line. Parker Chevrant made it three for three on extra points for a 21-0 lead. Franklin (2-0) will open Kelley-Rex division play next Friday night at Alumni Field against Mansfield. Milford (0-2) will look for its first win when it starts Davenport division play with a visit from Canton.